We grow quite a number of olive cultivars, some we use for pickling, and the rest we use to make our extra virgin olive oil. In the garden we have Mission, Delicata and Frantoio olives, and on the farm Hannes also grows Leccino, Don Carlo, FS17 and Coratina – all cultivars best suited for pressing olive oil. Black Calamata and green Nocellara olives are ideal for table use, and we pickle them in the cellar for almost a year before they are ready. 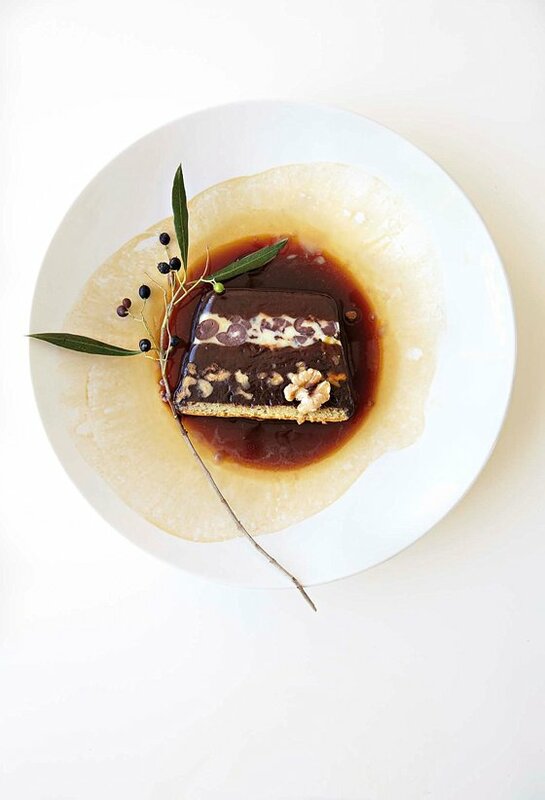 Here’s a recipe from our cookbook, Babel, for a decadent dark chocolate terrine using pitted black olives. LAYER 1: CAKE: In a double boiler melt 250g white chocolate. Remove from heat. Whisk 200g soft butter into the chocolate. Cream 160g eggs and 210g caster sugar. Add chocolate mixture to egg mixture. Fold in 100g of sifted flour. Spread on a baking tray lined with greased baking paper and bake for 10 minutes at 180° C. Allow to cool. Line a bread tin with cling film and cut the cake to fit the base of the tin. Place in freezer. LAYER 4: DARK CHOCOLATE In a double boiler, melt 175g chocolate and 110g unsalted butter, combine and remove from heat. Whisk in 4 egg yolks. In a separate bowl whisk 2 egg whites and 15ml sugar. Fold into egg mixture and dust in 150ml icing sugar and 40ml cocoa powder. Add 70ml double cream. Spread over white chocolate and cover with clingfilm. Place tin back into the freezer. ◗ When ready to use take the tin out of the freezer and remove terrine from tin. Take off the cling film. Using a warm, clean knife, slice a 1cm slice and place on serving platter. Allow to thaw for 10 minutes before serving topped with toasted walnuts and a shot of espresso. Cut as many slices as you need. Wrap the remaining chocolate terrine with clingfilm and place back into the tin to freeze again until needed. The fruit from the wild olive tree, or Olienhout olives, make a beautiful edible garnish. They have a sweet or sour taste. …whoa-eeh, my taste buds are drooling, what a mind blowing, spoonbending and spiritual blessings piece of cake. I will need to find out how it will taste with a glass of preserved grapes-Nebukanesar Red ??? Thank you Pieter for your very flattering words. Nebukadnesar is a must try, however for this specific recipe we suggest the Shiraz. It works very well with the dark chocolate flavours, and is robust enough to stand up to the savouriness of the olives, to create a beautiful balanced marriage of salty and sweet tastes.